The sleek, exquisitely designed BRAVIA™ V4000 series LCD TV makes a bigger, better home cinema experience even more accessible. This feature-packed television delivers exhilarating Full HD picture quality and seamless connectivity that's sure to excite home theatre fans. The stylish BRAVIA V4000 series is available initially in three screen sizes: 40-inch, 46-inch and 52-inch. Other screen sizes will be available from later this year. The BRAVIA™ 4000 series features elegant, understated looks inspired by Sony's innovative draw the LINE design concept. A sophisticated evolution from previous-generation TV designs, this minimalist philosophy accentuates the beautiful HD pictures being displayed without dominating your living space -- even at larger screen sizes. 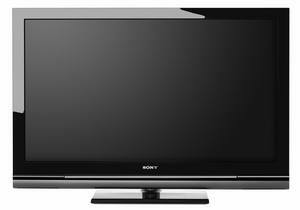 Featuring an integrated DVB-C/DVB-T tuner*, the V4000 complements a 1080p Full HD LCD panel with an array of advanced signal processing technologies by Sony. The result is supremely realistic images with any HD source, including Blu-ray Disc™ players, PlayStation®3 or Handycam® HD camcorders by Sony. Full HD picture quality is superb thanks to latest-generation BRAVIA™ ENGINE 2 technology that gives images an unmatched richness and depth. The LCD panel offers a very high dynamic contrast ratio of 33000:1 (40-inch, 46-inch and 52-inch models), ensuring deep, cinema-like blacks plus sparkling highlights. For an even more authentic home theatre experience, 24p True Cinema™ mode displays movies from Blu-ray Discs™ at the correct frame rate and thus the original speed. When the movie is not shown at the speed of the original studio master the picture quality and even the actors' voices are distorted. 24p True Cinema™ eliminates this traditional problem caused by the conversion from theatrical presentation format to the frame rate that conventional televisions use. BRAVIA™ Sync simplifies control of your complete home theatre system using the TV's supplied remote at the touch of a button. BRAVIA Sync also allows simple operation of a connected compatible Handycam® camcorder from the television's remote. Three HDMI sockets give extra flexibility, allowing one-cable connection to sources including PlayStation®3, Blu-ray Disc™ players and Handycam® HD camcorders. "The BRAVIA™ V4000 series represents a stunning synthesis of Sony's unmatched expertise in HD technology, user-friendly features and cutting-edge styling", says George Damigos, General Manager, Marketing, TV Operations Europe, Sony Europe. "The new V4000 series is a perfect answer for anyone who's looking to fill their living room with bigger, better Full HD pictures and sound. Best of all, it offers extraordinary value for anyone who's serious about creating a home cinema experience like no other." Product: As with all BRAVIA™ TVs the V4000 series is very energy efficient. The Auto shut-off function automatically turns off the TV when there is no input signal and enters the standby state. This also happens when there is no operation during a certain period of time. The Power Consumption on Standby mode is only 0.19 watt (for all inch sizes). All cover/ housing parts > 25g are halogen-free, as well as the printed circuit boards. The V4500 series also gives the user a choice of "home" or "shop" modes on first switch-on, with "home" mode having significantly less power consumption than "shop" mode, which is typically the only default setting (intended for very bright environments like shops). Using an integrated light sensor, the BRAVIA V4000 series can automatically measure ambient lighting levels and dynamically adjust the brightness of the TV, which helps to reduce power consumption in operation. Process: To ease the requirements for recycling, all parts used in the production of the BRAVIA™ V4000 series are easily separable. Also all plastic parts > 100g are made of one material or of easily separable materials. The material codes of all the plastic parts > 25g are according to the international ISO Standard 11469. For the halogen-free packaging VOC-free ink and 35% of recycled paper is used. The instruction manual is printed on non-chlorine bleached paper with VOC-free ink.